PostgreSQL supports several index strategies. The default is B-tree that can rapidly fetch records with a particular value. Elsewhere, it also supports Hash, BRIN, GiST, GIN and others that have own characteristics for each. PG-Strom supports only BRIN-index right now. BRIN-index works efficiently on the dataset we can expect physically neighbor records have similar key values, like timestamp values of time-series data. It allows to skip blocks-range if any records in the range obviously don't match to the scan qualifiers, then, also enables to reduce the amount of I/O due to full table scan. PG-Strom also utilizes the feature of BRIN-index, to skip obviously unnecessary blocks from the ones to be loaded to GPU. No special configurations are needed to use BRIN-index. 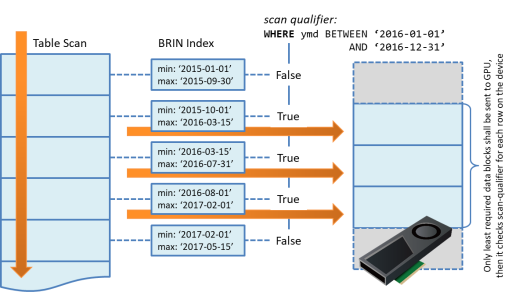 PG-Strom automatically applies BRIN-index based scan if BRIN-index is configured on the referenced columns and scan qualifiers are suitable to the index. Also see the PostgreSQL Documentation for the BRIN-index feature. By the GUC parameters below, PG-Strom enables/disables usage of BRIN-index. It usually don't need to change from the default configuration, except for debugging or trouble shooting. By EXPLAIN, we can check whether BRIN-index is in use. In the example above, BRIN-index is configured on the ymd column. BRIN cond shows the qualifier of BRIN-index for concentration. BRIN skipped shows the number of skipped blocks actually. In this case, 424704 blocks are skipped, then, it filters out 4385491 rows in the loaded blocks by the scan qualifiers. GpuJoin and GpuPreAgg often pulls up its underlying table scan and runs the scan by itself, to reduce inefficient data transfer. In this case, it also uses the BRIN-index to concentrate the scan. The example below shows a usage of BRIN-index in a query which includes GROUP BY.